The first media question raised in response to new economic growth figures is typically about resulting interest rates, but our real interests should lie in considering the impact on our planetary life support systems. 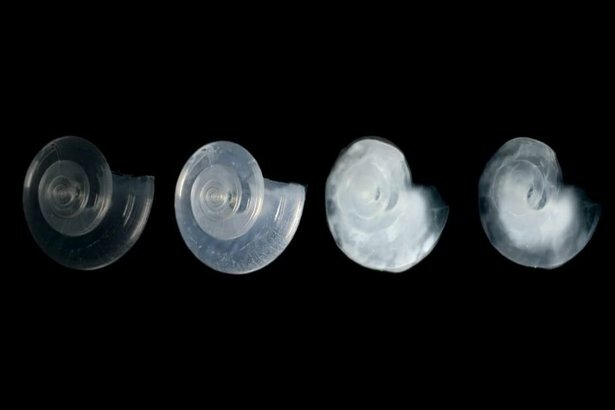 The BBC spoke to the New Weather Institute about new research on the damage caused by ocean acidification, described as the “evil twin of climate change,” and the result of carbon dioxide emissions from the human burning of fossil fuels, still used disproportionately to power growing economies. The oceans absorb about half of carbon dioxide emissions, but as this gas dissolves in sea water it creates carbonic acid, and the more that gets absorbed the more it shifts the pH value of the sea, increasing its acidity. Since the industrial revolution oceans have become 26-30% more acid. Marine life is extremely sensitive to acidity levels, with around half of animals already responding negatively to changes which are set to worsen considerably. Just like among humans, young animals are particularly vulnerable to the consequences of pollution. In one species alone, Cod, the research warned that the number of fish reaching adulthood could drop to a quarter, or just one in twelve, of current figures. Matters are made even more damaging because oceans also face multiple impacts from: climate change, other forms of pollution, building along coastlines, over-consumption of fish and chemical run-off and waste from industrial agricultural. Plastic pollution from product packaging and other waste has risen in importance too. Around the world one million plastic bottles a minute are bought by us, with plastic production predicted to double in just two decades. Not only is plastic entering the food chain because it is eaten by fish, but billions of people now, unwittingly drink water contaminated by plastic. But what is happening in the oceans is symptomatic of the overall pressure of our economic system on our underpinning biosphere, and the impact is pulling the ecological rug from under our feet. Other new research revealed another sign of the mass extinction event currently underway because of how we live and run the economy. German researchers identified that the abundance of flying insects on whom we rely for crop pollination, and which is a vital link in broader ecosystem food chains, has plummeted by three-quarters in just 27 years. This is the so-called ‘clean windscreen’ syndrome whereby the presence of healthy biodiversity used to be revealed by the number of insects meeting their end on speeding car windscreens. The shift puts us on course for “ecological Armageddon” according to one researcher involved with the project. On a very conservative estimate, by August 2, 2017, we had used more from nature than our planet can renew over the course of the whole year. A question put to New Weather by the BBC was, what should be the message to business in light of the evidence of the potentially irreversible damage we are doing to our environmental foundations. Our answer was simple, we need a shift of mindset to accept the simple, inescapable reality that we must operate within the boundaries of our biosphere, recognise these and work out what it means for what you can and can’t do. So, when we read about economic growth figures, our first question should not be about the cost of money, it should be about the price paid by our life support systems.